Remove hair effectively, completely painlessly, easily and quickly! Are you, like 90% of all girls over 15 years, tired of having to continuously shave? On a world tour, we have seen with our own eyes that this product works! The product is a new but simple invention. In the United States it is called a Smooth Away and is a smart plate with crystals. You run it over the skin, after which the hair roots are stimulated in a very special and unique way. After 1-2 minutes of treatment, your skin will be soft and delightful. When the hair grows back, it is thinner and softer, and the process becomes easier each time you use the product. In contrast to traditional shaving, by using this treatment you avoid using chemicals. As a bonus it is also quite painless, and you can avoid red buds. 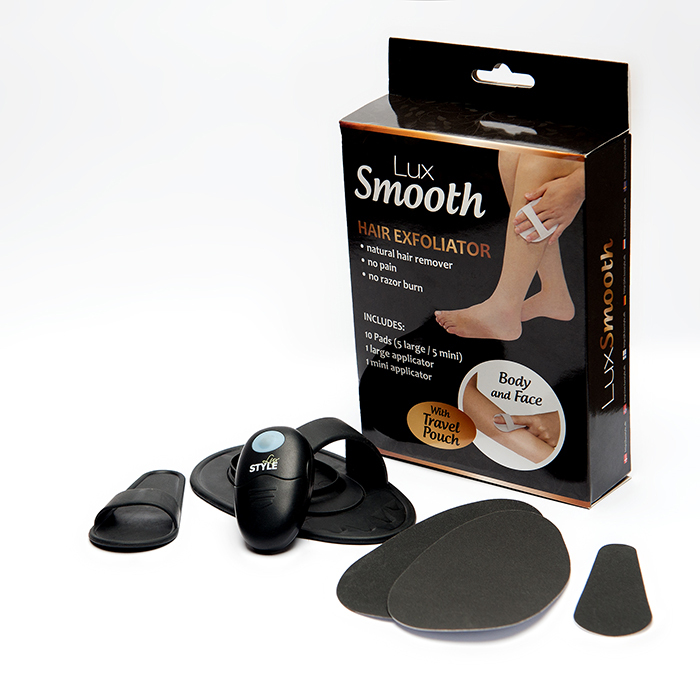 LuxSmooth removes the hair quickly and efficiently! The plates that will be delivered to remove hair are made out of the earth's best materials known in the industry. 500 LuxSmooth have just been delivered from the United States to our warehouse. Since we would like to have ratings on the website, we are now offering a 50% discount to the first 500 customers! Have tried Smooth Away today. And yes, it lives up to the expectations, even though I was a little skeptical. A nice shower after with a scrub glove and a good lotion and you will feel like you just returned from a wellness center. 5 Stars. It is indeed a very good product, particularly if you want it to last longer than a shave. It scared me a little since it felt a little like sandpaper, but as soon as you use them on your skin, it's not at all painful. It is a great product and very easy to use. Anyone can do it, and that makes you feel good. And I must say, it is cheap.